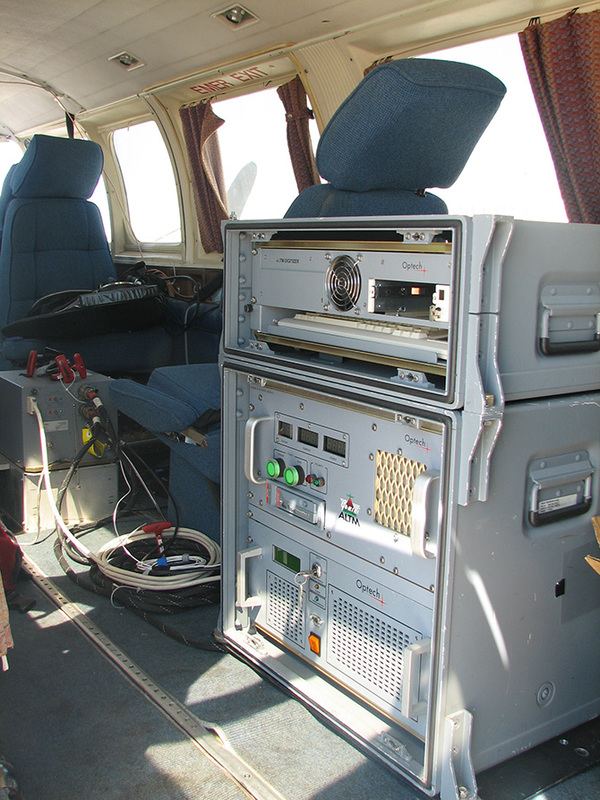 Figure 1: NCALM’s LiDAR apparatus mounted in a twin-propeller airplane. 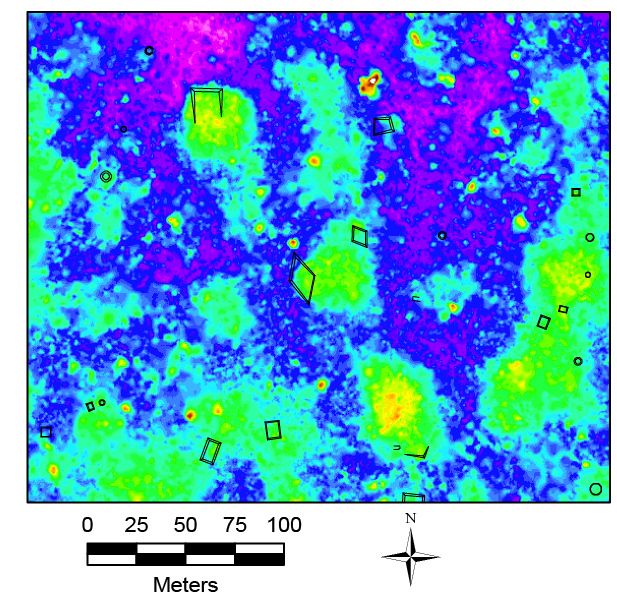 Figure 3: An area where LiDAR worked well. ancient mounds found on foot are visible on the mapping. Figure 4: An area where LiDAR did not “see” many of the features that were found on foot (outlined in black). This is the second post in a series by Scott Hutson. Read his first post here. Juan Fernandez’s email from the National Center for Airborne Laser Mapping (NCALM) contained precisely the attachment I was looking for: a high precision relief map of a large swath of the area currently under investigation by archaeologists of the Uci-Cansahcab Regional Integration Project (UCRIP). The technology behind the map is called LiDAR, an acronym which stands for Light Detection And Ranging. Under the direction of Ramesh Shrestha, Juan’s team produced the LiDAR map by mounting a laser and an extremely high-accuracy GPS onto a low-flying plane that flew back and forth over the countryside (Figure 1). Using this method, NCALM produced a map of the Mayan site, Caracol, Belize, in 2010, and the results were spectacular. The LiDAR apparatus sees through the canopy like an X-Ray seeing through skin and locates not just every decent-sized mound, but even the low terraces on which the ancient Maya sowed their crops. Opening Juan’s attachment, however, made me nervous. The vegetation is different here in Northwest Yucatan than it is in Belize, and the scrub forest was greener than I had hoped when the plane flew, making it harder for the laser to “see” the ground surface. Would the map show the kinds of house platforms we needed to find? Why does any of this matter in the first place? In order to choose where to excavate, archaeologists must understand the settlement pattern of the area where they work. For archaeologists who work at a regional scale, the term settlement pattern refers to the location and quantity of different kinds of sites in the region: cities, towns, villages, hamlets, roads, cemeteries, quarries, seasonal camps, artificially modified agricultural plots, and more. Before digging at one of these sites, archaeologists must first understand something about all the other kinds of sites in the study area—the settlement pattern—so that they understand the regional context into which their excavations fit. The only way to know whether you are digging at a small site or a large site is if you know something about the range of variation exhibited by sites in your region. The same principle applies to the scale of the site itself: We want to know what kind of buildings exist in a site before choosing which buildings we excavate. In dry parts of the ancient Americas, gathering data about settlement patterns is relatively easy. With a team of surveyors, you can walk across several square kilometers of terrain per day, locating sites and assessing their size along the way. In most parts of the Maya area, however, vegetation is so thick that surveying a single square kilometer can easily take a few weeks and several encounters with poisonous snakes and wasps’ nests. With LiDAR, dozens of square kilometers of topographic data can be collected and processed in less than a week and with no snake encounters. Over the summers of 2008, 2009, 20011, and 2013, UCRIP surveyed about 14 square kilometers by foot, covering much of the sites of Uci, Kancab and Ucanha as well as a 500m wide strip extending the 8km from Uci to Kancab. The LiDAR mapping would nearly double our coverage and fill in the 10km long gap between Kancab and Cansahcab, where the causeway ends (Figure 2). As I opened the LiDAR map Juan sent me, I breathed a sigh of relief. 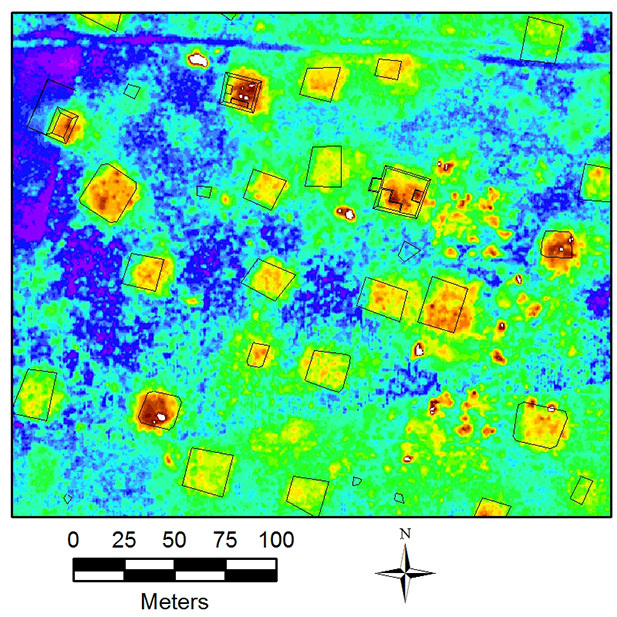 House platforms that stand about a meter high and cover an area of about 15m x 15m were clearly visible (Figure 3). Now that we know where all the major mounds are along the eastern half of the causeway between Uci and Cansahcab, we can answer questions about which sites were the biggest and how rural farmers distributed themselves across the countryside. Furthermore, we can devise a sampling strategy to determine where to excavate in the future. Unfortunately, our LiDAR data did not permit us to detect small structures that we found while walking some of the same area (Figure 4). Because of this important limitation (which might soon be eliminated as the technology advances), LiDAR may not yet revolutionize Maya archaeology, but it does save an enormous amount of time when asking questions about the past. I thank Mark Kornbluh, dean of the College of Arts and Sciences at the University of Kentucky, for his generosity in funding this endeavor and Mary Anglin, chair of the Department of Anthropology, University of Kentucky, for standing behind the value of my research in Yucatan. And, of course, a big thanks to Ramesh Shrestha, Juan Fernandez, and NCALM for doing the LiDAR. Scott Hutson began doing archaeology in Mexico in 1994. He received a PhD in anthropology from the University of California at Berkeley and currently works as an associate professor at the University of Kentucky. His most recent book is called "Dwelling, Identity, and the Maya."